Vapour2 (a V2 sister company) have provided a lot to the vaping industry. Their products are known to be innovative but never lacking in quality thanks to the niche they have carved. Something that you certainly don’t want to miss out whether you’re a fan of V2 or a new vaper is the Vapour2 Trinity vaporizer, a sub-ohm kit that is great for beginners and advanced users alike. 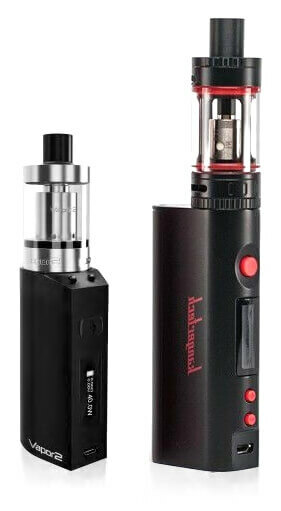 The Vapour2 Trinity is also the first sub-ohm offering from Vapour2 and makes its mark by its simplicity and ….its size! Compared to the competition this must be the sleekest vape mod available. The Vapor2 comes in an incredibly small and stylish form factor. It’s certainly something that you could carry around discretely and its durable construction makes it feel like a premium product. Unlike many other vaporizers of this class and size, the Vapour2 Trinity really does stand out in a class of its own. It’s also incredibly lightweight and fits nicely in the hand, but don’t let its small size fool you because the Vapour2 Trinity is capable of outputting some serious clouds. The vaporizer itself sports a sleek look with a smooth finish and is available in two vibrant colours. It’s quite eye-catching which is excellent because this is the sort of vaporizer you’ll take out when you’re on a break at work or when you need a moment away from a party. It’s certainly one of the most compact sub-ohm set-ups that have graced the market. The Trinity also comes with a battery life that lasts over 450 puffs and can easily be charged via USB. Again, this makes it a convenient little machine to take around with you whenever you want to vape. There’s a clear battery indicator on the side and it shows you everything you need to know including resistance, voltage and wattage level. Despite the small size, the screen is crystal clear and you’ll have no trouble reading off it. The Trinity kit comes with both a 1 Ohm and 0.8 Ohm (sub-ohm) quality coil. To add to the convenience, the Trinity is compatible with both PG and VG e-liquids. Vapour2 themselves have a huge selection of different e-liquids to choose from, but they also carry top brands like Vsavi (pure VG specialists), Void e-Liquids so it’s convenient to order alongside your unit. Their site is very user-friendly and there are descriptions for each e-liquid, making it easy for you to choose. The 2ml tank capacity is a bit awkward at times, but considering the size it’ll probably be the least of your complaints. This 2ml size is however a legal TBD requirement. 2ml can still keep you vaping for a long time, but if you indulge in long sessions then it will require perhaps 1-3 refills per day depending on how you vape. Fortunately, because it’s such a small unit, replacing the liquid and cleaning it both come very easily. Simply screw the drip tip off and then pour in your e-liquid. There are two large holes to pour but be careful if you’re using a larger dropper. • If you want bells, whistles and iPhone connectivity – this may not be for you. The Vapour2 Trinity kit is certainly an impressive offering. Other vape mods feel cumbersome by comparison. 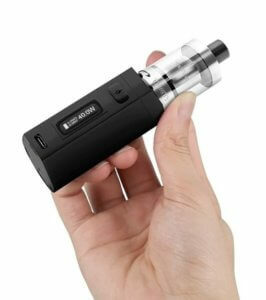 Vapour2 have gone to great lengths to make something that is sleek, stylish, portable and powerful. The battery lasts long enough for this type of vaporizer, and the compatibility with both PG and VG e-liquids is fantastic. However, it does come with a slightly higher price compared to some competitors. Considering the high quality of the Trinity and if you are looking for the neatest vape mod then this is about the best you will find. If you can pick up the Vapour2 Trinity in a sale, then it will also make the perfect accompaniment to your other vape gear. If it’s your first vaporizer and you’re looking to invest in something a little more premium and that feels small and comfortable, then you can’t go wrong with the Trinity kit. It will give you the full experience while being suitable for beginners and having plenty of convenient features. If you just want something powerful, portable small and convenient to use out in the open, then the Vapour2 Trinity is a great option as well. The two colours will give you a little choice with how it looks (especially if you’re going to be seen with it) but it can also act as a concealed vaporizer that will fit perfectly in your pocket, purse or bag. For a small form factor and very easy to operate high quality vape mod you wont find a better product!